For a limited time you can get "501 Tips & Ideas for Finding More Time" for only $19.95 That's 20% off the regular $24.95 list price! Format: Instant Download PDF E-Book Just think what you could do with an extra hour, or 2 hours per day. That comes to an extra 14 hours per week to do whatever you wish. Your time is precious. Become a master of your time and you get more out of life. Today is the day that you begin finding more time for the things you love. *** SEVEN FREE BONUSES *** You'll also receive these additional bonuses, absolutely FREE! FREE BONUS #1 ($24 Value) Time Management for Creative People by Mark McGuinness It’s so easy to get side-tracked and lose control of your time. This is especially true for creative people. Time Management for Creative People will help you focus on the important things in your day and show you how to eliminate interruptions and time wasters. FREE BONUS #2 ($18 Value) Dealing with Blamers by Catherine Pratt Blamers are people who always blame someone else for whatever happens. They always make it look like you are somehow at fault. Blamers can make your life miserable if you let them. Dealing with Blamers will help you understand how blamers play their mind games and how you can protect yourself from their destructive behaviors. FREE BONUS #3 ($21 Value) If This is My Comfort Zone... by Charles Burke Charles Burke contends that we are actually UNcomfortable in our comfort zone--that’s why we want to get out of it. In this eye-opening report he reveals why we stay in uncomfortable situations when we actually want to move to a better place. He’ll show you how to open the very doors that are keeping you from living the life you were meant to live. FREE BONUS #4 ($21 Value) The Bold Living Guide: Key Ingredients for a Meaningful Life by Barrie Davenport Most of us respond to the circumstances life hurls at us rather than creating the life we desire. Learn the 7 ingredients that can help you create the kind of life you wish to live. FREE BONUS #5 ($21 Value) 10 Ways to Ignite the Passion in Your Life by Sharon Reid Discover how to use passion to intensify your experiences and inspire you to bring your dreams to life. Prevent boredom and mediocrity and, instead, live the successful and fulfilling life you desire! FREE BONUS #6 ($21 Value) Productivity Proverbs: Timeless Age-Old Time Management Wisdom by Dr. Jason Raj Productivity Proverbs™ are timeless, age-old, time management wisdom that has been passed down by our ancestors from generation to generation. Many are play on words, witty and memorable. But most of all, they tend to be remarkably accurate and quite useful in helping you master your time. FREE BONUS #7 ($24 Value) Get Organized Now! Reader Tips Presented by Maria Gracia Get Organized Now! readers have shared hundreds of excellent organizing tips over the years. This volume captures the very best. Total Value of Bonuses: $150 Yours FREE! 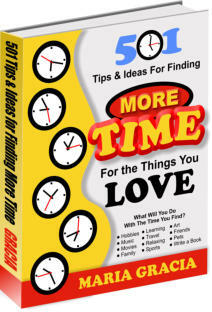 501 Tips & Ideas for Finding More Time Regular Price: $24.95 Now Only $19.95 (Save 20%) Format: Instant Download PDF E-Book Plus You’ll Get These Seven Free Bonuses: 1. Time Management for Creative People 2. Dealing with Blamers 3. If This is My Comfort Zone... 4. The Bold Living Guide: Key Ingredients for a Meaningful Life 5. 10 Ways to Ignite the Passion in Your Life 6. Productivity Proverbs: Timeless Age-Old Time Management 7. Get Organized Now! Reader Tips FREE BONUSES = $150 Value! time saving solutions, if you feel they don’t give you more time with your family and for the things you love, then simply contact us at the email address listed below within 60-days and simply ask for a refund. We will issue you a prompt refund and you can keep our bonuses if you wish. We can’t be any more fair than that. You have nothing to lose. Sales Ends In . .